Last week, Vera Solutions was recognized as Best for the World for creating positive impact as a mission-driven business based on an independent, comprehensive assessment administered by the nonprofit B Lab. 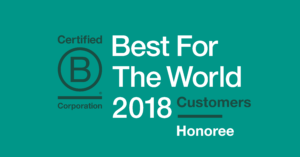 This year we are thrilled to be honored in both the Best for Governance and Best for Customers lists, a recognition that encapsulates our company values — impact, excellence, sustainability, teamwork and leadership — both in the way we work and the products and services we deliver. Vera has been a proud Certified B Corporation since January 2012, upholding rigorous standards for social and environmental performance, accountability, and transparency. Over the years, we have embraced new ways to promote a corporate culture of social responsibility and continuously drive our sustainability goals forward, including updating our recruitment practices and committing to offset all calculable carbon emissions that result from business practices as part of the B Corps Inclusive Economy Challnge. Every year, the B Impact Assessment (BIA) allows us to effectively reflect on our practices to see where we excel as a social enterprise and where we still need to grow. 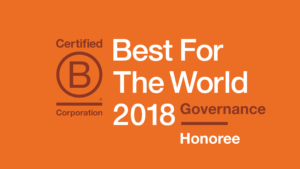 This is the second consecutive year that Vera has scored in the top 10 percent of all B Corporations in the Governance category, which evaluates a company’s overall mission, ethics, accountability and transparency. Broadly, the Governance portion of the BIA measures whether a company has adopted a social or environmental mission and how it engages its employees and the community to achieve that mission. For the past eight years, Vera has remained true to its mission of amplifying the impact of the social sector. Leveraging the best cloud and mobile technology available, we strive to give organizations unprecedented access to their data to make better-informed decisions. “Being recognized for Governance speaks to our own commitment to the principles of accountability and transparency that we work to enable and inspire in our clients’ work,” says CEO Zak Kaufman. The ‘Best for Customers’ honor embodies the impact Vera’s mission has on the organizations we serve. This section of the BIA measures how a company affects its customers (i.e. whether a company sells products or services that promote public benefit and if those products and services benefit underserved populations). Today there are more than 2,400 Certified B Corporations across more than 150 industries and 50 countries, unified by one common goal: to redefine success in business. Any company can measure and manage social and environmental performance at //bimpactassessment.net.